Here in the US Thanksgiving Day traditionally falls on the fourth Thursday of November. While it is one of my favorite holidays today is a day of thankfulness for me as I’ve been honored to be named a Veeam Vanguard for 2018. I’ve been fortunate enough to have been a part of the group since its inception and it is one of my highest honors. Thanks as always to Rick, Kirsten, Dmitry, Andrew, Niels, Anthony, Michael, Melissa and Danny for keeping the Vanguards the best of its kind around. To those who have also been renewed into the program please accept a heartfelt congratulations as you’ve earned it through your involvement and I look forward to trolling right along with you for another year. While the e-mails have just been sent so there aren’t any statistics yet I see quite a few new members who are quite deserving popping up on twitter. Some I know already and other I look forward to getting to know. One of the really nice thing about the Vannies is we are a small group so everybody pretty much gets to know everybody. If you are looking for success in this group please don’t be shy, come be social and share the knowledge you have. Are you just learning about the program or didn’t make the cut this year? If you are active with Veeam join the conversation in the forums, on Twitter, on Reddit, any of the various Slack communities, or your own blog and it will come. It doesn’t matter where you join, it just matters that you do. If you haven’t noticed the new content on this site has got a little scarce for the past few months. To be very honest my life seems to have been a bit crazy, both professionally and personally, and writing, unfortunately, has been back-burnered. On my drive home yesterday I was listening to Paul Woodward‘s excellent ExploreVM podcast episode with Melissa Palmer where she was speaking about the process of writing her excellent book “IT Architect Series: The Journey“. This served to remind me that I really should get back to writing as I’ve got a few topics I really need to blog about. So as these things often happen in my head this led me this morning to think about why I blog in the first place. There are a number of reasons I do this and I thought for those that are passionate about any topic but in this case about technology maybe a little bit of the why would be the thing to get you started yourself. 1. So I can remember how I did something. Way back in the olden days (2004ish?) when my blog was called tastyyellowsnow.com this was the main reason I created the blog. I was 3 jobs into my career and all of my notes for how to do anything were saved in Outlook notes that I move from a work account to PST to work account to PST to work account. I was tired of doing it that way so I thought I’d try putting it out there. That hawtness ran on some asp based package with an Access database on the backend (I still have it! ), and while some of the content was absolutely horrible the reason behind it is still my primary driver, to make sure if I figured out how to do something a certain way I could remember how to do it when I invariably had to do it again. Looking through some of those titles some like “Changing the Music On Hold Volume in Cisco CallManager” and “Recovering from a Bad Domain Controller Demotion” are still actually relevant. It’s nice to know where to find those things. 2. So that others can learn how I did something. I joked on twitter the other day that in preparing a Career Day talk for my daughter’s Kindergarten class that I should title it “SysAdmin: I Google things for those who will not”. If you are new to IT or aspire to work as an *Admin I cannot express how much of my “how in the world do you know that” is simply being good at feeding errors into google and processing the results. There may be 20 posts on how to do a single task but one of them will make more sense to me than others. Because of that, I try to feed many things back into the collective Google, especially the things that I wasn’t able to find much on or that I had to piece together through multiple KB articles and blog posts. In doing so I really do hope that I help others get their job done without having somebody send them the sticker to the right. 3. Writing something down in a manner you expect others to understand can often provide clarity. There’s an old adage that says “the best way to learn something is to teach it.” While yes, it is cliché, speaking as a former adjunct college professor and current internal staff trainer when needed, it is absolutely true. When I am learning something new or I have just finished working through a complex issue I find that documenting it, either here or internally helps to solidify what the core issue was, what components led to the issue, how the problem was solved and finally how it can be prevented in the future. Those are the reasons why you see new things here from time to time. I do want to mention one thing you did not see above and that was to gain access to influencer programs. I’ve been very fortunate to be included in the vExpert and Veeam Vanguard communities and while many will say the way to get there is through blogging I disagree. I think the best way to achieve those accolades and keep them is the develop your own version of commitment to the Tech Community. If you find that giving things back to the community at large is something you find value in then you will find a way to do it, blogging, tweeting, podcasting, or any other way. If that’s a goal of yours and blogging or writing isn’t your thing, there is any number of ways to meet that goal as long as you focus on why you are in the community to start with. As life has its ups and downs so does the regularity of content here. What are your reasons for blogging? If you have thought about it and haven’t done it yet, why not? Let’s continue the discussion on Twitter by reaching out @k00laidIT and help the distributed mind grow. I am lucky enough to be a father to a wonderful 5-year-old daughter, fresh into her Kindergarten year of school. Recently she came home with the dramatic cry of a 5-year-old, upset that her class has a Leader of the Month award and she didn’t win it. Once the sobbing subsided she got around to asking me how to be a leader, one of those basics of life type questions that all parents know and yet always get thrown by. How do I boil down the essence of leadership to something she not only can understand but can apply herself? Thanks to the reoccurring themes of Special Agent Oso I got the idea to try to condense leadership to 3 simple steps. Simplistic I know, but the more I thought about it the more I realized that not only would it get her on the right track but that, to be honest, there are a great number of adults in leadership positions that experience differing levels of success with them. So thanks to my daughter and our good friend Oso I present Jim’s 3 simple steps to being a good leader. Seriously, there are so many studies/articles on the effect that a leader’s public attitude has on the productivity and efficiency of their team. If those linked articles aren’t enough for you Google it, there are a lot more. I know we all have our days when it all falls apart and have experienced these myself, but when those days stretch into weeks or months that team you are leading or even being a part of is going to start to fall apart as well. Some days it is going to require you to put a good face on what you are internally feeling, but coming in with a bounce in your step and not being negative is a great first step. One of the realizations that I’ve had recently is that with any position there comes a time when you have to decide to either have some internal reconciliation with the job you have and make peace with the issues you have with it or decide to make the jump to something new. I’m not saying you should try to make the things you dislike better, you absolutely should, but staying in something you actively dislike and have lost the willpower to try to fix not only hurts you it hurts those around you. So for a 5-year-old trying to get them to listen to anything that isn’t on Netflix or YouTube is a challenge. Guess what? The same is true for me and you and those around you in the workplace from time to time. As framed to her, listening means making sure you pay attention not only to your teachers when they talk (and you absolutely must do this) but also to those around you that may be having issues. The teacher is talking about how to make the perfect “R” but your neighbor is having a problem? If she’s got it down this is a great opportunity to help! As we complete our journey through leadership we need have to apply what we’ve learned in the first two steps. We’ve spent the last 20 minutes learning how to make that perfect “R” and now we have to practice in class. My 2.0 may have this down, but she see’s her neighbor is trying to get help from the teacher. With a great attitude and an understanding of what’s expected this is her time to shine and help out her classmate! At work this is important too. We have a great attitude now and we really want to be a helper, getting things done, and we’ve listened to those around us and learned not only about the needs and processes of our organizations but also the needs of our co-workers and staff. With all this ammo we are now in a position to truly make a difference because regardless of who you are helping when the knowledge gets distributed the potential for greater outcomes goes up. For those of us in traditional IT or other “support departments” this is where the true value lies. If we can’t learn, interpret and apply technology to the organization and staff’s needs then we aren’t supporting anyone. So there you have it. Yes I know it’s simple, yes I know there are other factors (ego, time management, etc) that go into it as well but as in all things, you have to master the basics first. How many of you that have made it to this point were shaking your head and considering interactions with others as you read them? How many read these and had a “doh” thought about something you yourself have done? I know I did in thinking about it and there’s nothing wrong with that as long as you learn from it. It has been a great day here because today I learned that I have once again been awarded acceptance into the excellent Veeam Vanguard program, my third time. This program, above any others that I am or have been involved with takes a more personal approach to creating a group of awardees who not only deserve anything good they get out of it but give back just as much to the community itself. In only its 3rd year the group has grown; from 31 the first year, 50(ish) the second, to a total of 62 this year. There are 21 new awardees in that 62 number so there really isn’t a rubber stamp to stay included, it is legitimately awarded each year. The group has grown each year but as you can see not by the leaps and bounds others have, and for good reason. There is no way this experience could be had with a giant community. At this point in the post I would typically tell you a bit about what the Vanguard program is and isn’t but honestly, Veeam’s own Dmitry Kniazev really put it best in a couple recent posts, “Veeam Vanguard Part 1: WTH Is This?” and “Veeam Vanguard Part 2: What It’s Not.” What I will add is that as nice as some of the perks are, as DK says in the Part 1 post the true perk is the intangibles; a vibrant community full of some of the smartest, most passionate people in the industry and in many cases access right to the people approving and disapproving changes to their software. These are the thing that made me sweat approval time. Once again I would give a giant thank you to Veeam Software and especially the whole Vanguard crew. This includes Rick Vanover, Clint Wyckoff, Michael White, Michael Cade, Anthony Spiteri, Kirsten Stoner, Dmitry Kniazev, Andrew Zhelezko and finally Doug Hazelman. Without these people it wouldn’t be nearly as nice. The Most Magical Time of Year: Influencer Program Selection Season! Each year many of the major companies in the tech industry allow people to be nominated, by themselves or by others, to be recognized for the contributions to the community that surrounds that company’s products. These people are typically active on social media, in both online and in person forums and user groups and often will write blogs about their experiences with the products. In return for what is essentially free, grass-roots type marketing the companies will provide awardees any number of benefits; access to licenses for products for homelabbing as well as sometimes access to engineers, preferred experiences at conferences, NDA level information, etc but in some cases the biggest benefit is the recognition itself. As of today (November 10, 2016) two of the bigger and in my opinion one of the best programs are all open for nominations. I’m honored to be both a vExpert and a Veeam Vanguard and like to think of myself as an honorary Cisco Champion (they can’t accept government employees) so I have some experience with each of these programs. Let’s take a look at all three. VMware vExpert may not necessarily be the oldest influencers program but it is probably the one socially active technical people know except possibly the Microsoft MVP program. In many ways vExpert is not only an honorary of its own right but a launch pad towards acceptance into other programs. vExperts are as far as I know the largest such group with around 1500 members world-wide, it also boasts some really good benefits not only from VMware but from other companies in the virtualization ecosphere. There are many webinars and meet and greets throughout the calendar year which are either vExpert only or vExpert preferred and the vExpert party at VMworld is well-known as one of the best. The distinction I make most about vExpert is that while it is for and by VMware, some years much of the educational focus is on the ecosphere and community that surrounds it. The vExpert program offers 4 paths to membership. The one most are in is the Evangelist path. These may be customers, partners or VMware employees themselves, but they are people speaking the good word of VMware. There are also specific paths for Partners and Customers but I don’t know that I’ve ever met anyone who was awarded in those tracks. Finally if you have achieved the highest level of VMware certification, VCDX, you automatically are awarded vExpert status. Cisco Champions contrasts from vExpert most because it is a self-contained program with all the educational opportunities and benefits being from Cisco Systems itself. With the Champions there aren’t so many of the freebies with the notable exception of some nice perks if you attend CiscoLive, but what they do offer is exposure of your personal brand. 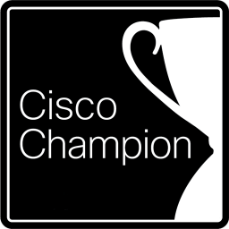 Between the weekly Cisco Champions Radio podcast and the regularly featured blogs on Cisco’s website if you are working to make a name for yourself in the industry for whatever reason it is a very good program for that. Further Cisco gives you access to developers and program managers within the company so that you can not only gain greater understanding of the products but in many cases have the opportunity to weigh in on technology decisions during the development process. Cisco breaks their program down into business segments in regards to your qualification for the program with tracks in Collaboration, Data Center, Enterprise Networks, IoT, and Security. If you have expertise in any of these by all means apply. In my mind I’m saving the best for last. The Veeam Vanguard program opened its nominations up today for its 3rd year and I’ve been honored to have awarded each year (so far). It is by far the most exclusive; there are currently only 50 members worldwide and I believe the philosophy is to keep it on the small side with only people who truly understand what the company is about. There are a lot of swag type benefits to the Vanguard to be sure, most noticeably something really special that revolves around their VeeamON conference (NOLA this year baby! ), but to be honest what I most get out of the program is the distributed brain of not only the Veeam employees affiliated with the group but the group itself. On a daily basis it seems sometimes somebody’s technology issues, Veeam related or not, are being sorted out through Vanguard communication methods. Long story short, in the Vanguard program they simply take care of you and I’m happy to call all of them not just my peers but friends. Because Veeam is a much tighter set of products than the other two there aren’t any official tracks within the program. That said they are very good about selecting members who affiliate themselves with each of the hypervisor companies they support, VMware’s vSphere and Microsoft’s Hyper-V. This diversity is part of what makes the discussions between us so good. Over the course of the past week I’ve heard various people talking about strategies regarding getting awarded to any number of these. I’m not going to do this one so I can focus on that one and so forth, and honestly all I can recommend to you if you are interested in applying to any of them is look at where your focus is or where you focus should be and apply. There is no thing that says “you belong to too many programs” or anything like that; if you feel you are qualified for any of these or any other by all means go apply. The name of the game is to grow your involvement with the technology community, regardless of what type of technology it is. I was born and raised in a small area between Charleston and Huntington, WV. While I recognized my hometown, Scott Depot, was a small town growing up I thought of both those cities as just that, proper cities with all the benefits and drawbacks that go with them. As I grew older and my worldly view wider I came to realize that what I considered the big city was to many a minor suburb, but never the less it was and still is my home. This lack of size and economic opportunity has never stood out more than when I began my career in Information Technology. After graduating from Marshall University with what I still believe to be a very respectable skill set many of my fellow graduates flocked to bigger areas such as Columbus, OH, RTP and Atlanta. I chose for a variety of reasons to stick around here and make a career of it and all in all while not always the most stable it has been fairly successful. There are very few large datacenters here with most datacenters being composed of a handful of racks. Some go to work for various service providers, others enter the VAR space and I found my niche in what I like to call the Hyper Converged Administrator role. The HCA tends to wear most if not all of the hats; virtualization, storage, networking, server administration, etc. I consider myself somewhat blessed that I’ve managed to avoid the actual desktop admin stuff for most of my career, but still some of that too. In the past couple of years I’ve got more and more active within the social IT community by way of conference attendance, social media and blogging and while it hasn’t necessarily changed the direction my career is going it has radically changed it in that I have found great opportunities for growing my personal knowledge. This growth in some cases has been very strictly technology related by way of pushing me to explore new facets of IT systems management I didn’t previously consider as well as access to very knowledgeable people who are usually very eager to point you in the right direction when asked. In other ways this knowledge while IT related is more oblique in that I feel like I now have a much better understanding of what life is like on the other side of the various fences (vendors, VARs, datacenter admins, etc) than I ever did before. This latter knowledge base has greatly changed how I approach some of the more political parts of IT such as vendor management and internal project pitches. While the global Internet community is great I find that the missing piece is still facetime. The richness of communication when I’m at conferences is more personal than anything that is done online and I find myself somewhat jealous of those in areas large enough to support user groups of any kind of size. In the past year I’ve got to know VMware User Group (VMUG) leaders from Louisville, Kansas City, Phoenix and Portland as well as the guys behind the excellent career oriented community vBrisket and enjoying hearing tales of what’s involved in getting their regular meetings together and wish I could do the same here. Personally my goal for the coming year is to do a bit of travel and attend the meetings of some of the User Groups listed above. If you are local here in the WV IT community reach out and let’s figure out how to do something here. There may not be a lot of us here but that’s an even better reason to get to know each other and share the knowledge. Where In The VMworld Is Jim? Two weeks from today the official start to VMworld 2015 begins and to say I am excited to head out is a bit of an understatement. VMworld is a great place to learn more about a different branch of virtualization, see the bleeding edge of this technology and meet new people or renew conversations with some of the brightest minds in the industry. I myself will be focusing on VDI, specifically in the case of Disaster Recovery, and looking at Hyper-Converged systems this year along with all the other fun stuff. While this is only my second year going I’ve found that one of the biggest challenges to VMworld is schedule management; if you are interested in the social/community side of things you can very well go 20 hours a day Sunday through Thursday. Even with that you are going to be challenged to hit all the things you want because there is a great deal of overlap. With a paid conference attendance you (or VMUG Advantage membership) you will be able to view the vast majority of sessions online after the fact, but that doesn’t help with the get out and meet people stuff. Since by nature I am a schedule driven kind of guy I took some time this weekend to kind of map out the whats and the wheres to what I want to do and in hopes of getting to meet up with the 5 people who may read this blog I’ll throw a copy of it out here. The sessions are still in flux because there a few that are full that I still hope to make it into, especially a couple of the Expert Led HOL Workshops, but I think I’ve got the rest of it worked out. Hope to see you there! It seems like just last year I posted that I had redone my website in Drupal and had gotten back into blogging, ok, gotten back into blogging somewhat. I am a pretty big fan of Drupal, I love their community driven method, the flexibility, the do it yourself of it all. As time went by though I found myself with less and less time available to deal with the community driven method of website development, lots of flexibility and the do it yourself of it all at the personal blog site level. Further I was especially stymied by the almost nonexistent support for blogging from mobile platforms. I tried various methods of dealing with this, but none of them felt as easy as anything on an iPad should feel and what was there seemed to rely on either hosting through Drupal Gardens or on running an outdated version of the Blog API module. So for all those reasons and more this week I’m pretty happy to say that I’ve now ported this site over to essentially the anti-Drupal, WordPress. WordPress comes in both community and commercial flavors, but while I don’t think in 4 years of working with Drupal I saw a single paid module or theme that wasn’t custom work almost everyone I’ve found so far has at least some relationship with a commercial product in the same ecosphere. Even with that so far I’ve found it to be an economically viable option as long as free isn’t your ceiling. In this post I’m going to outline some of the things I’m finding helpful and some of the challenges and differences between the two I’ve had to work my way through. Continue reading WordPress Here We Come! Happy New Year’s Everybody! While it most definitely had its high points 2013 over all was a bit challenging for me. So with that said and a liberal dose of optimism I have to say that I am looking forward to what 2014 will put before us. While I’m sure the employer will have me start outlining some goals to work towards there, I’d like to share some personal goals I’ve thought of for 2014. Enhance my scripting skills. Namely this means powershell, python, and esxcli with the end goal being to start performing greater automation throughout the enterprise. For years I’ve got by with some decent use of vbscript to do the basics on the Windows side of the shop because that’s where most of the need was. As our needs have started shifting towards the virtualization side and with the coming wave of Software Defined Networking (SDN) it’s about time I start learning something new. Become VCP5 certified. Last year ended up being a pretty Cisco centric year for me from an educational standpoint with me reupping my CCNA and adding a CCNA Voice to the mix, not to mention attending Cisco Live. This year I want to build upon the VCA-Datacenter I gained recently and finally get around to doing the VCP 5 Datacenter exam. I’m still not a big fan of Vmware’s enforced class policy for certfication, but as I’ve already taken the Install, Configure and Manage vSphere 4 class this means all I have to take is the What’s New in vSphere 5.5 course. Blog More on the Macro. One good thing about 2013 is I did what for me was a lot of blogging, mostly at 4sysops.com. I think in total I posted about 15-20 times last year and in the process I managed to start blogging for myself again, something I haven’t done in years. This year while I’ll still do some of the straight how to pieces that I did quite a bit of last year I want to use this medium to help myself find new ways of thinking and get out of my comfort zone, so expect to see more posts like this in the new year. Attend a major IT conference again. Last year I had the great experience of attending Cisco Live in Orlando, Florida. It is always a good thing to be able to immerse yourself in situations where you can expand your knowledge and this was that ability on a grand scale. While I don’t know if it will be Cisco Live again this year, most likely it will be Vmworld, I definitely want to make this a yearly thing rather than an outlier. Refocus on health (start running again!) For the past couple of years I’ve done what I consider to be a great job of focusing on my health and I have seen some pretty darn good outcomes, with any measure I can think of showing positive trends. For the past 6 months or so I’ve seen this focus wan as other things in life have done an excellent job of getting in the way, but this is something I want/need to change. I’m going to get back in the habit or running 3 or 4 times a week. Further look for a post in the near future regarding some of the mobile technologies I’ve found to be really helpful in managing your weight and overall health. Provide greater training to fellow coworkers. This would be mostly to get more utilization out of already in place systems and greater efficiency out of staff. From our perspective this would mean less call IT, more doing. There are many ways you can describe my employer, but the way I tend to think of it is as a smaller medium size business with an enterprise point of view when it comes to technology. Over the course of the last few years we’ve made some great strides in putting new technology in place to increase the ability of our staff to collaborate and some have really caught on, others not so much. In a lot of these cases I think the lack of use comes from a general lack of understanding of how it works and I hope to rectify that this year. Well that seems like plenty of list as it is so I’m going to go ahead and stop there. How about you? What goals do you have for this year? Let me know either in the comments below or on twitter @k00laidIT. Healthy food doesn’t always have to mean no taste. As I’ve had to deal with various health issues over the past few years I’ve had to learn to make some things that I really love in a new way. One of these things is chili, which I could happily eat every single day without issue. Below is the recipe I’ve been tinkering with for a while now and I’ve got it to the point where I really like. Give it a shot and if you find a way to improve it by all means please let me know! Cover it and let it simmer on low no less than an hour, but as long as you can until time to serve. When done in a perfect world I really like it with peanut butter sammiches (JIF natural crunchy to be specific).